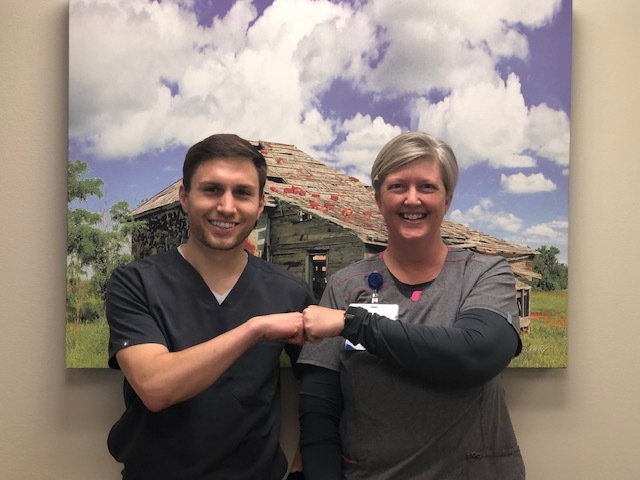 Bryce is attending the University of Kansas School of Medicine and is in his 4th year completing his Rural Medicine Rotation. Bryce is shadowing Dr. Jen Brull. I grew up just outside Newton Ks! I went to Newton High School then attended the University of Kansas for undergrad where I received my BS in Microbiology. I discovered how boorish benchtop research was during those four years and how much I love talking to people – so I became a physician! I have had friends over the years from the Hays area who, over the past year spoke so highly of the Plainville family medicine physicians. The Rooks County Health Center has a wonderful reputation as an institution students such as myself are able to not only experience the classic rural family medicine practice, but see patients within many settings such as the emergency department or Doctors Without Delay. What do you hope to be when you’re out of school? Why? I plan on becoming an Emergency Medicine physician! I love meeting patients for the first time and leading them through the arduous and often very frightening process in emergency care. I think specialized medicine is important, but I would much rather learn the skills to help anyone who walks through my door. I love the procedures, ultrasound exams and quick thinking that makes up the typical emergency department shift. The doctors and nurses here in Plainville are some of the best I have experienced in my medical career. They are wonderful to work with and have so much expertise. From inpatient stays to outpatient visits. Delivering babies to running emergency traumas, these doctors are great role models and can tackle any problem. I’m a runner. I am a big fan of 10K and half-marathon events, and training for these races is a very welcome relief from the stresses of Medical School. In the rest of my spare time, I am a huge reader, coffee roaster, hiker, and fan of Kansas Athletics. I think Plainville is the perfect place for me to learn advocacy and autonomy. The family medicine physicians here are very connected with the daily lives of their patients, and this allows them to advocate for them in a way not always possible in larger communities. Autonomy is a staple of family medicine and a cornerstone of rural medicine. I hope to discover additional autonomy here as I transition into my residency training as an Emergency Medicine physician.